Nihon Falcom’s military academy JRPG, The Legend of Heroes: Trails of Cold Steel, was first seen on PlayStation 3 and Vita back in 2013. Two years ago, XSEED games released an excellent PC port of the game and now, almost two years later, it finally sees a PlayStation 4 premiere for the Western audience. So, much time has passed since the first time 17-years old Rean Schwarzer and his classmates enrolled illustrious Thors military academy. 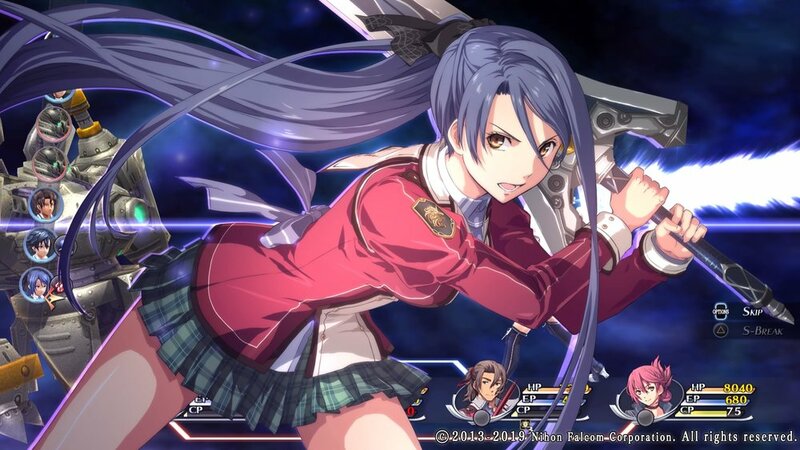 Given that Trails of Cold Steel looked somewhat outdated already upon its original release, how can it hope to cope in today’s world of hard-hitting eye candy that comes off almost customary? The games in The Legend of Heroes series all tell about the same fictional world and era. Trails of Cold Steel takes place in a steampunk-ish Erebonia where a class dispute between the nobility and commoners is deeply etched to the local society. The empire’s history has seen several skirmishes that has emerged from the class system and once again, a fear of a civil war is more than prominent when the nobility clashes with the imperial forces. It’s here where Rean and eight other students find themselves in a newly formed Class VII that for the first time in the academy history mixes together commoners and nobles. Usually, there are separate classes for them and the hierarchy to comply it, with nobles getting all the luxuries and the common folk more mundane accommodations. As always, there’s a reason for everything but for the time being, the boys and girls of Class VII just must cope with the situation – and with each other – under a guidance of an informal homeroom teacher Sara. Since the game is much about the life in Thors military academy, it follows the curriculum of Class VII with studies, practical exams, field trips and free days. Rean runs about in a 3rd-person view across campus, the local town and several locations spanning Erebonia where long train trips take him and his co-students. Monsters are fought either on outdoor locations or in several dungeons. Combat is turn-based and in addition to characters’ physical and special attacks (crafts), each student’s portable ARCUS unit enables use of magic arts that can be expanded by synthetizing quartz at orbment charging stations in several locations. When the enemy is unbalanced with a type of attack it’s vulnerable against, it allows a follow-up attack between linked students for some extra damage. Later, each characters’ super move (s-craft) is unlocked for screen-shattering damage dealing. On the whole, the battle system is flexible and fast-paced, allowing a vast palette of tactics to overcome foes. There are up to four active members in the combat party. The game likes to regulate who are available for the job at any given time as the field line-up shifts when the story progresses. 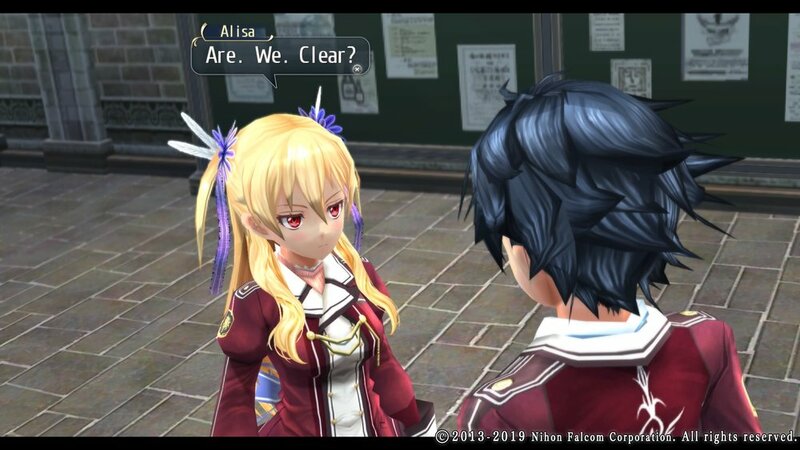 As the first game in the series, Trails of Cold Steel lays out a lot of groundwork to introduce the world and its history, class system, society, governmental hierarchy, and of course, the key players in the story. Each one of them, from the students themselves to the powers that be and enemies alike, is rounded out in a plentiful detail. You really get to know these characters inside out but still, there are room for some shocking twists and turns. Long and constant narrative scenes don't get irksome, as they usually find something interesting to say or expose. The chemistry between Class VII students develop as time spent together goes by, friendships grow and young romances blossom. It's all so heartfelt. It takes time until things start moving in the grand scale and shake up seemingly serene studies at Thors academy. Before that, there’s a lot of busywork to do. Free days are spent on running errands to the Student Council and doing other side activities, such as completing bonding events with Class VII students that pay off in improving combat links. Luckily, there are handy tools to help managing things to do; a throughout quest log prints out everything in detail and two maps aid in navigating around, one for fast travel between places, showing all the key players and quests needed to do, and other for expanding the minimap to show immediate location in a more detail. Still, it can take a considerable amount of time to achieve everything to rank up Rean’s school grade and advance the story. It means a lot of legging around story scenarios (the PS4 version has an optional turbo mode to speed up moving). I like how Nihon Falcom's games avoid typical JRPG genre overkills. Trails of Cold Steel is no exception. The game is very much grounded in everyday life, both in school routines of Class VII students and mundane lives of citizens of Erebonia who live in a constant uncertainty in a more than likely turmoil between the nobles and the imperial forces. In their field trips that take place across Erebonia, Class VII students get to witness people's plight firsthand as they try to resolve local problems. More often than not, they find themselves inadvertently kicking hornet’s nest when the real culprits behind seemingly unconnected incidents start to unravel. Even though I played the PC version of Trails of Cold Steel two years ago, the game still feels fresh and captivating. I didn’t want to rush through even the longest narrative scenes but instead devoured them like in the first time. When compared against the likes of Final Fantasy series, the game wasn’t a looker to begin with but I found its simple, crisp and clean visuals delightfully refreshing. There’s also a lot of personality in character models. Even though they all are saucer-eyed anime dolls, they still look individual. Lots of immersion comes from the excellent translation and localization and superb English dub. The PC version didn’t have original Japanese voices as an option but the PS4 version, declared as “Decisive Edition”, includes them. However, Rean, Alisa and other students of Class VII just didn’t come out right to my ears in Japanese. Besides, English dub adds some 5000 more spoken lines to the mix, greatly enriching the story-telling. What also gets pulse pumping is absolutely stellar soundtrack, especially in battles with bouncy and heavy bass lines laying ground for groovy violins and electric guitars. The next part of The Legend of Heroes: Trails of Cold Steel still comes from XSEED Games but the third game in the series will be published by NIS America. I can only hope that they will retain the same exquisite localization and the voice cast I have grown attached to. Anything less and it just won’t do. I’m pretty sure that the save files will be compatible, though, as there’s no technical reason why they shouldn’t be. If you have played Trails of Cold Steel either on PS3 or PS Vita, you’ll be happy to know that their saves are compatible with the new PS4 version. JRPGs come in all kinds of forms and often in frivolous visions. You may get tangled up in overly perplexed systems that won’t make any sense, or get confused with twists and turns of incomprehensible stories that has got badly lost in translation. Nihon Falcom games are quite the opposite. They stick to a strong script and down-to-earth story-telling with a gameplay that comes player first. However, that’s not saying that they are boring. Trails of Cold Steel gears up as the story progresses and ends up in such a cliffhanger that you just want the next part out already. The game remains as strong as it has been and comes strongly recommended for any JRPG enthusiast looking for a cracking yarn to spend time with. When all is said and done, Trails in the Sky the 3rd comes out as a balanced, thoughtful and inspiring JRPG. What The Legend of Heroes: Trails of Cold Steel may lack in production values, it makes up for in the richness and depth in its unpretentious and diverse narrative. That makes following Rean and his friends during their year of study uncannily engaging entertainment. I can’t think of any better way to get acquainted with The Legend of Heroes series than this. The only thing bothering me right now is how long I have to wait for the second part! The Legend of Heroes: Trails of Cold Steel IIis a heavyweight JRPG with plentiful narrative, detailed plot, rich characterization and intricate combat system. Chamber of Time is slow-paced, looks a bit drab and it can be repetitive and awkward to play. In a way, it’s much like Akko herself. She’s far from perfect but spunky and open-hearted, making her irresistibly disarming. There’s a strong positive vibe going on that rubs on you, and it helps in overcoming the game’s shortcomings.